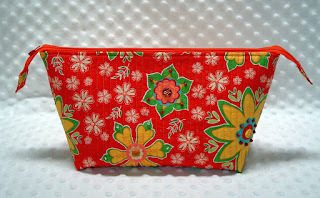 Sandra Sews :): February was a dreary month! February was a dreary month! Sorry about the pink background in this picture - I had to run out the door to go to a luncheon where the bag was The Gift, so I was in a hurry. 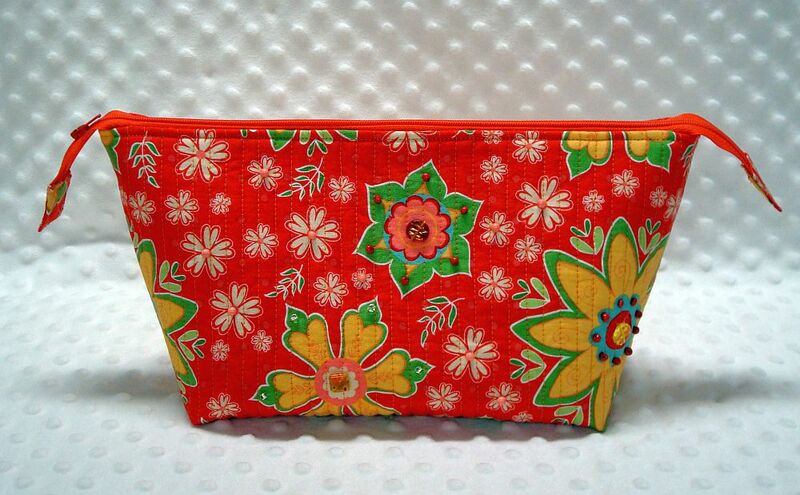 It's just a simple denim bag, lined with some pretty royal blue fabric. It was sized to hold a specific gift, which I hope the recipient likes! How cute is that rocket ship zippered pouch!!! I'm guessing you'll be making more of those. My mind is going to all kinds of bad places thinking about what could hang off that lip pouch zipper. 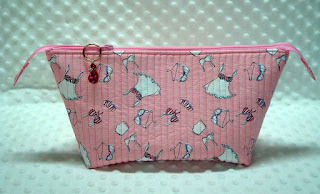 Anyway, must get some of those pouches finished so that I can sew on the beads while on vacation. That will be great handwork for carrying. And that rocket is soo cute. I may have to break down and buy the pattern. No, wait, no boys around to appreciate it. Damn! Also--NO APOLOGIES FOR PHOTOGRAPHY ALLOWED! We are lucky that you take the time to post photos at all. You are not getting paid for this blogging stuff. You don't have to post perfect photos. If it happens to work out, well, that's great, but you don't owe readers professional photos all the time. We are lucky to get to see the things you make at all! 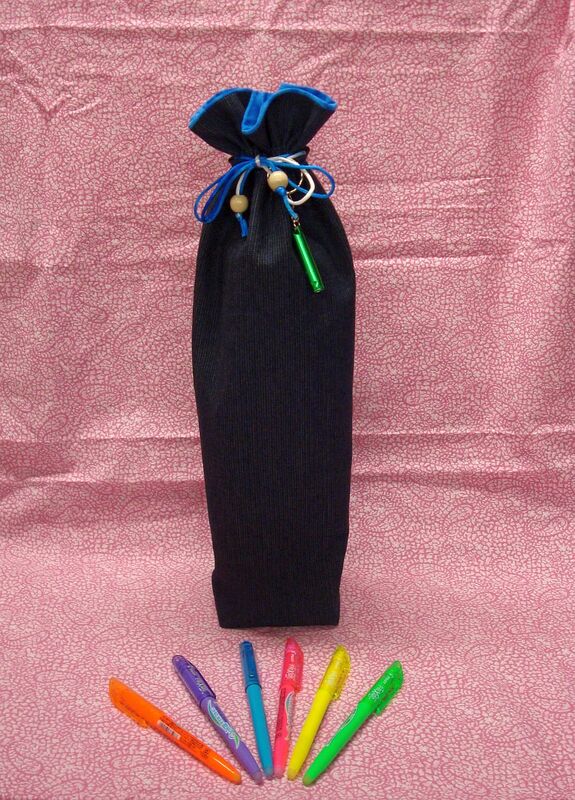 (Love that dark denim bag with the inside fabric contrasting so nicely--another idea that will be stolen--thank you. I want the rocket ship. Clear window to see inside - adorable. bwaaahahaha the lip purse is AWEsome! I love your whimsey... we're two (flamingo)birds of a feather. Thanks for stopping by my blog and I'll have to return to see what silliness and fun you're up to! Keep in touch! Well for being a dreary month, you sure got a lot done! 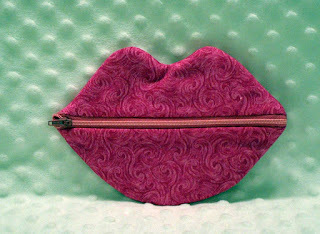 Love the lips - you need a zipper pull shaped like a chocolate candy. *G* The rocket ship is awesome!!!! 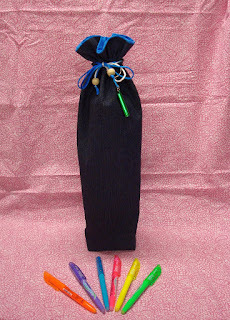 The tall gift bag is lovely, did the recipient like the gift? What was in it????? 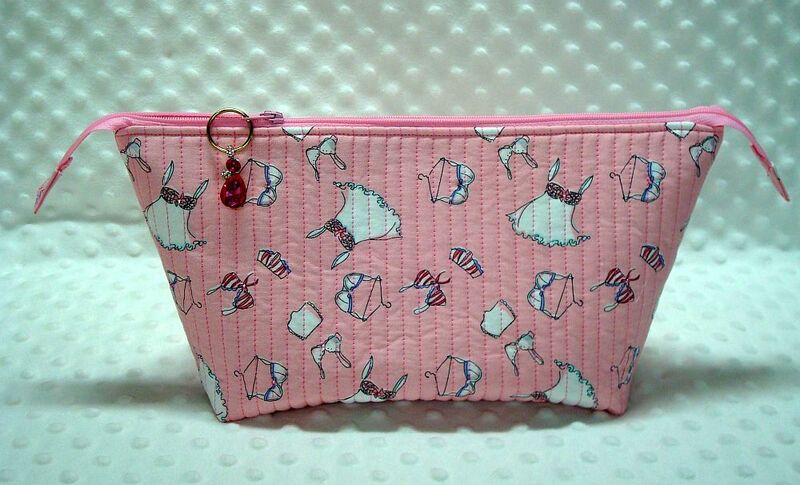 Lots of fun zipper pouches! 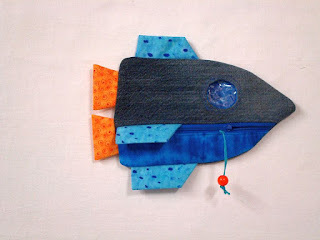 Cute pouches and the rocket one is awesome!